A breath of fresh air is blowing at Motorola. After the initial, confusing years following the takeover by Lenovo, the traditional brand is gradually repositioning itself. During IFA 2018 in Berlin, I got the opportunity to meet the new European General Manager of Motorola to talk about his future direction and strategy. Lenovo Moto: which smartphone is best for you? Since the takeover by Lenovo, Motorola has been somewhat hesitant about brand strategy. At first, Motorola was removed from the marketing vocabulary, and Moto was put in the foreground as the brand name for Lenovo smartphones. Since then, the company has taken a 180-degree turn and the Motorola name is once again back in the limelight, at least outside of China. While talking about this volatile brand strategy, I asked Antony Barounas how he survived the culture shock. Before his new position at Motorola, the top manager was, after all, responsible for the European smartphone business at Sony Mobile. Immediately after the first question I knew I had found a very direct, but also likable conversation partner in Barounas. Compared to Sony's corporate culture with fixed structures, processes and an always present HQ in Japan, Lenovo/Motorola is much more independent. In plain language, this means that as head of Europe, Barounas makes the decisions for his markets without having to justify them at the company headquarters beforehand. In his own words: "I have the feeling that this is 'my' business"". At Lenovo/Motorola, Barounas got what he didn't get much of ten years ago: The freedom to make decisions. But at the same time, the responsibility for every decision he makes now rests solely on his shoulders. For Barounas, the latest rebrand brand from Moto back to Motorola was not necessary. But the decision has been made and will remain so for at least the next three to four years, so that consumer uncertainty does not return. But Lenovo/Motorola is not alone with this phenomenon. During his time at Sony there were similar discussions about going with either Sony or Xperia as a smartphone brand. Pressure's on: What are Lenovo's plans with Motorola? Lenovo or Motorola, which brand in the group stands for the smartphone business? The answer here from Barounas is clear: both. Each brand has its strengths on the global stage. 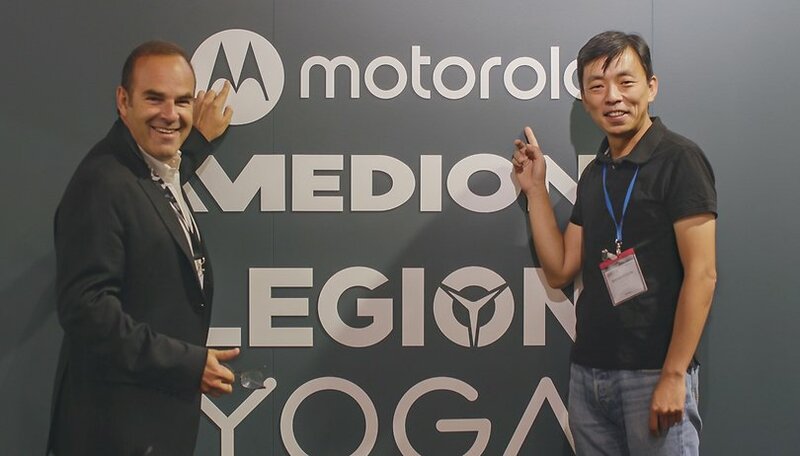 While Motorola is traditionally strong in the US, Latin America and Western Europe, Lenovo is well represented in China. Before agreeing on a global brand, it’s worth exploring a two-brand strategy. It would cost Lenovo one billion US dollars alone to replace the Lenovo brand with Motorola in China and India. Lenovo would rather save this horrendous sum and put it into the products than make an unnecessary brand shift, where not a single smartphone is sold for a long time. Barounas also added that a two-brand strategy can be quite successful. Huawei, for example, is very successful with its own and its sister brand, Honor. As we all know, Huawei has now achieved the second spot among rival smartphone manufacturers with this dual brand strategy. Lenovo’s top boss, “YY”, has publicly stated that he wants to break into the world’s top five smartphone manufacturers list. In addition to YY’s ambitions, Barounas is aiming for a 10 percent market share in his Europe. If you look at the distribution data by Canalys for the first quarter of 2018, Motorola is not even in the top 5, but YY and Barounas are on the same mission here, it's just that Barounas is more specific in his goals. But how is Motorola and Lenovo supposed to conquer that 10 percent market share Barounas talks about? Barounas said that he did not want to take part in the game for market share simply to play it, but that he was in it to win it. We're not just along for the ride, we're competing to win. The means by which he wants to gain market share with Motorola are also logical, even if it is against his nature as a "flagship" type. When he joined Lenovo a year ago, he wanted a Motorola flagship smartphone, but soon realized that mid-range smartphones, designed to meet the needs of many people, could help him capture market share. Barounas certainly is more focused on return on investment than the prestige that can be gained with a top smartphone. Afraid of Xiaomi, Oppo and Co? Nope! Conquering market share with mid-range smartphones is no longer easy these days. In addition to established brands such as Samsung, Huawei and Co, other Chinese manufacturers are storming Europe. But names like Oppo, Xiaomi and Co. do not trigger fear in Barounas. He says confidently that the newcomers to the European market do not have the knowledge and the necessary personnel to quickly gain a foothold throughout Europe. Chinese brands such as Xiaomi, Oppo and Co. need employees who know their way around, especially for business with network operators and on the retail market. The new brands do not yet understand how the European "smartphone playing field" works, and he believes that it will remain this way for at least another two years. During this time, Motorola can work out its goals. As incredible as it may sound to an outsider, Barounas is definitely right when he says that Lenovo is probably the most un-Chinese Chinese company there is today. Maybe this is where Motorola's long-term success, under Lenovo's flag, as it is for ThinkPad or examples from other industries such as Volvo and Geely. @Albin that's funny. When I see someone who spent $1000 on a "recognizable flagship" phone, I think to myself "stupid lemmings, my $249 Moto is a much better deal"
I think Huawei & Honor are doing much better than Lenovorola? Actually there is no comparison. Lenovo's z2force was probably the worst flagship of 2017. Sales were terrible. Then they turn around and give us the z3 with last year's 835processer. A 5g mod that only God knows the price & release. They should stick to what they do best mid-rangers like the g6. Huawei has the upper hand & vastly improved phones even without the US market. Plus they just knocked off Apple for the #2 vendor. You can't compare apples & oranges!